Altering Your Brain Waves for Better Sleep: Pseudoscience, or Neuroscience? It almost feels like you can't go a single day without hearing about some new gizmo, gadget, doohickey, or dinglehopper that's designed to help you sleep better. Well, for some of you, today's advice may seem like no exception - at first, at least. We're going to talk about how to alter your brain waves in order to get better sleep. Although it sounds like something out of a science fiction movie, it can actually work! Below, we'll go over the science of brain waves, what that means for you and your sleep patterns, and how you can hack your brain into getting some of the best sleep you've ever had. Alpha Waves - When your brain is emitting alpha waves, you are in the perfect state to start getting the quality rest you need to stay healthy. In this state, the brain is either still conscious but deeply relaxed, or it is in a very shallow level of stage 1 sleep. Furthermore, if you happen to be still conscious in an alpha wave stage, have fun and take advantage of it - the vast majority of neuroscientists have seen proof of increased concentration, creativity, learning, and visualization in the parts of the brain which control those functions. Theta Waves - Halfway through the sleep cycle, your brain will enter what is known as a theta wave state. 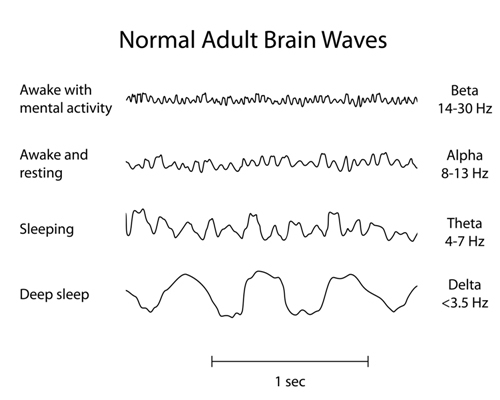 Your brain can start emitting theta waves at any point during sleep stages 2, 3, or even REM sleep. Theta waves are a bit of a mystery to scientists because, although your mind is in a deep state of unconsciousness, there is still an abundance of neurological activity going on (such as dreaming). Delta Waves - The most beneficial rest you get at night happens during the deepest stages of your sleep cycle. During this time, your brain enters a delta wave state. Most higher neurological functions go dormant while your brain and body focus on cleaning up daily wear and tear on your cells and updating the brain based on your experiences from the day. Think of it like a software upgrade that happens every night when you sleep, except it is storing permanent memories and updating your knowledge based on whatever you learned while awake. Conscious Wave States - There are three levels of beta waves, along with gamma waves, that represent our brain in its conscious state. Since this article is all about sleep, we won't go into too much detail here; suffice to say that these wave states are home to a wide range of brain activity from complex thoughts to high anxiety to euphoria and more. As we mentioned in the previous section, getting quality, restorative rest is important for both your physical and mental health. And just because a prescription sleeping pill or an over-the-counter sleep aid forces you to lose consciousness doesn't mean you're getting quality rest. You can still experience unhealthy signs of sleep deprivation if you rely on chemical substances to get to sleep at night. But if you try and take a more natural approach, you can give your body the sleep it needs with a fraction of the cost and effort. Although brainwave entrainment - the process of coaxing your brain into a specific wave state - is usually defined by the utilization of sound, light, or electromagnetic fields, you can reproduce similar results without any equipment. Careful, mindful meditation can have a similar effect on calming your brain and, at the very least, getting you into an alpha wave state. If you do some research online, you can find quality meditation programs which can help you train your brain to be ready for rest at bedtime. Isochronic tones require a little bit more hardware than meditation alone, but many users swear by them. Whether you use headphones or not, the sound pulses emitted buy isochronic tones disrupt your neurological activity just enough to coax it into the wave state you want it to be in. You can find free audio tracks online of isochronic tones designed for sleep, and you can either manually play them under the music/white noise of your choice, or you can find audio tracks with relaxing sounds that have isochronic tones and embedded within. Binaural beats are the most sophisticated method of brain entrainment - and because of this, they require not just a machine that is capable of playing sound, but stereo headphones as well. This is because each ear gets a slightly different sound frequency (measured in hertz, or "Hz") played into it. The minor difference in frequency bombarding your brain from both sides produces a mild, harmless form of disorientation which manually alters your brain waves based on the state you wish to achieve. It's easy to find specific audio tracks online for free which are tailor-made to put you into an alpha, beta, and even delta state with little to no effort. Similarly to isochronic tones, some of these audio tracks embed the binaural beats within relaxing music or white noise. Whether you try hacking your brain with entrainment techniques, whether you're still skeptical of the process, or whether you want to combine different non-chemical methods for getting better rest, you should couple your efforts with a natural sleep aid for the best results. We have reviewed many of them on our site and we encourage you to take a look at what our research experts found. Many of our own employees use brain entrainment along with herbal sleep supplements to get the restorative sleep they need for optimal health and wellness. And we recommend you give it a try, too.